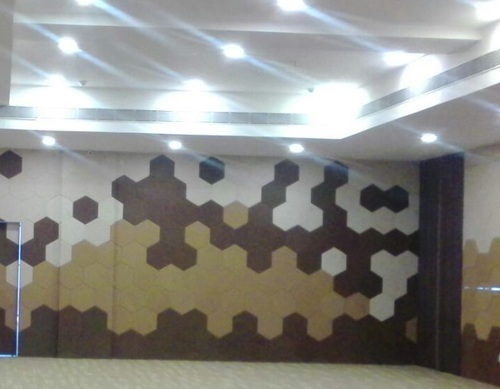 Times Acoustic Wall Panels- TAP are the latest innovation in a fast developing segment of the building industry. It epitomises green product manufacturing by using Post consumer PET bottles and using them to make acoustic insulation panels for Walls and false ceilings. No effect of humidity on the performance of the boards. easy to clean - only vaccuming required. With every sqm of TAP boards , we are recycling 150 PET bottles. GO GREEN , SWITCH TO TAP. Established in 2001, Times Fibrefill Pvt. Ltd. has grown from strength to strength over the years and today emerged as a leader in the manufacturer and exporter of Technical Textiles, Organic Baby Products, Bed Linens, Quilted Products & many more. Headquartered in Kolkata, India, the company boasts of state-of-the-art and fully automated production facilities. Our commitment to international standards, timely delivery and quality has allowed us to carve a niche in the global market. We at Times Fiberfill have also ingrained innovation into our company’s objective. Our team of innovators ensures that our range of products is contemporary, new and exciting. Our flexibility and eye for innovation combined with our core competency and service quality allow us to create tailor-made solutions for our clients. Our manufacturing units have in-house laboratories capable of performing all the necessary tests. The R&D activities at Times Fiberfill are focused on the emerging industry trends, the business and social fiber and the needs of the end user. Our corporate governance policies are aimed to meet the business expectations of our shareholders, clients, customers and employees. Our Corporate Governance processes are also directed at ensuring that company actions, assets and agents are directed to achieving this purpose while complying with the code of governance and the company’s own policies and expectations. We at Times Fiberfill lay maximum emphasis on sustainable development and therefore ensure that all our products are Eco-sustainable. We make sure that we deal only with suppliers and clients who are not involved in unfair work practices and child Labour. At the same time, we take every possible step to provide our employees with the safest and most comfortable working conditions. The wages we pay to the employees are also above industry standards which help us retain quality talent at Times Fiberfill.